We’d love your help. 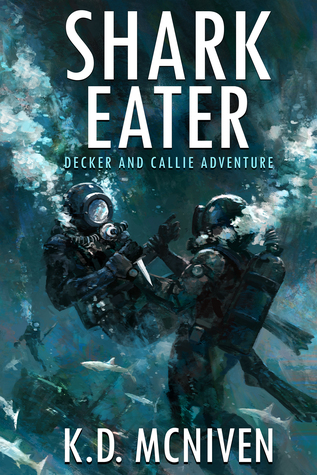 Let us know what’s wrong with this preview of Shark Eater by K.D. McNiven. To ask other readers questions about Shark Eater, please sign up. Shark Eater is a name of a ship in which the crew are in search of treasures in the ocean. Dax and his team get attacked by pirates and manage to turn them in. The crew believes that things are behind them and while asking for grants to do a dive on a ship dating back to the 1500s. They meet decker and Cassie Hayden who also enjoy diving to explore archaeology and are asked to come along. Through the trip they find a ship dumping near where they are diving and everything goes to crap. This book Shark Eater is a name of a ship in which the crew are in search of treasures in the ocean. Dax and his team get attacked by pirates and manage to turn them in. The crew believes that things are behind them and while asking for grants to do a dive on a ship dating back to the 1500s. Shark Eater! What an exciting title! And this fast-paced and engaging book lives up to its name and hooks the reader with plenty of intrigue and adventure. Shark Eater is a salvage ship. The story of this ship provides a fresh plot and storyline. From Hawaii to the Caribbean, from tales of Captain Cook to shipwrecked Spanish galleons, paired with great scenes of scuba dives, treasure hunts and underwater archeology- this book and the story of the Shark Eater captivated me. Along with an adrenalin surge of excitement, Shark Eater also features so many memorable characters. Decker and Callie are archeologists who travel the world; they have joined with the Australian Dax and his Shark Eater salvage ship crew to investigate an area of the Caribbean known for its well-traveled historic route used by Spanish ships on their way back to Spain. The crews’ adventure and excitement at researching a newly discovered centuries-old shipwreck become our adventure too. I shared the characters’ sense of awe. But there is trouble in the tranquil paradise as the Shark Eater crew discovers a sinister and dangerous plot. The crew must defend themselves with their wits and their guns and these fight scenes are thrilling and well-written. In another beautiful part of the world, the crew of Decker’s boat, The Jade, and Decker’s father are enjoying a leisurely trip of scuba and snorkeling when they discover some historical artifacts that will lead to a tragic adventure. In addition to the main characters, one of the lesser characters really grabbed my heart. Cato is a young Haitian boy whose bravery and open soul play a pivotal role in solving a crime. So Shark Eater is full of adventure, great locales, and fascinating characters. What else do you want? How about the chance to learn some interesting history and facts, presented in an enticing manner? I enjoyed reading about the Florida Panhandle Shipwreck Trail and I also loved learning more about Hawaii. Did you know that one-fourth of the world’s fish, plants and invertebrates are indigenous to Hawaii? And you still want even more from this book? Then you will have to read it through to the last climactic scene which involves Decker and a helicopter! Disclaimer first; I was given a free e-copy of this book in exchange for an honest review. Shark Eater is an action adventure story, the sequel to The Monkey Idol, and continues in the much the same feel as it’s predecessor. The story is still centred around Decker and Callie, two people who are ostensibly archaeologists, but seem to suffer from the same problem as the great Indiana Jones and forget this fact on regular occasions. This is fortunate however, as I the book would fail to fulfil its Disclaimer first; I was given a free e-copy of this book in exchange for an honest review. Shark Eater is an action adventure story, the sequel to The Monkey Idol, and continues in the much the same feel as it’s predecessor. The story is still centred around Decker and Callie, two people who are ostensibly archaeologists, but seem to suffer from the same problem as the great Indiana Jones and forget this fact on regular occasions. This is fortunate however, as I the book would fail to fulfil its description as an action-adventure story if it were a treatise on archaeology. As a whole, the book takes much of what was good about the previous book and moves it to a nautical setting. Rather than a trek though the jungle, the book introduces a whole new range of problems for the main characters by moving the action onto the high seas. There are two overarching plots which run through the whole book, with a number of subtexts to keep things interesting. Again, McNiven has done a fantastic job of researching her topic, setting up scenes which truly immerse the reader into her world. The plot is engaging, moved along a good pace, with a good mixture of character and scene setting along with action scenes. There are a number of twists and turns through the book, with the death of one character coming out of left field, which I found to be very disappointing and which did somewhat sour my enjoyment of the book. Unfortunately, the book also brought along some of the more irksome personality traits of its main characters. There is still a certain amount of clunky dialogue between characters, and the good/bad dichotomy is still prevalent. There is also a prevailing feeling that the female characters are an afterthought, which is a shame as there is scope to develop them into much more. This is an adventure/action book and the story really keeps you moving at a quick pace. It reminded me of a Clive Cussler book. There are almost two separate plots. The first is the story of Decker & Callie with salvager Dax and their search for a shipwreck from the 1500’s but the second is Garrett (Decker’s dad) with his new wife diving and finding coins on their honeymoon. This was a tough review to write because I did like the story and it kept me engaged. However the adventures almost se This is an adventure/action book and the story really keeps you moving at a quick pace. It reminded me of a Clive Cussler book. There are almost two separate plots. The first is the story of Decker & Callie with salvager Dax and their search for a shipwreck from the 1500’s but the second is Garrett (Decker’s dad) with his new wife diving and finding coins on their honeymoon. This was a tough review to write because I did like the story and it kept me engaged. However the adventures almost seemed to be too much at times. That along with minor conversations that were a little sappy and female characters that were not quite up to the developed level of the males leads me to say it is a good book, just not great. But if you don’t mind that and like Cussler – give it a read, you might just like it. Another fast paced adventure with Decker and Callie. Packed with action and heart pumping fights and narrow escapes. Two main parallel story lines keep the action flowing and the author pulls no punches when it comes to the resulting denouements. An adventure for fans of Clive Cussler and frenetic action and set piece fight scenes. A rollicking adventure that starts out quickly and only accelerates from there! But not just a standard "action-adventure", as this book delves into the intricacies of professional divers searching for wrecks and history. The book is very much a cross of Allan Quartermain and Jacques Cousteau, with a bit of Magnum PI thrown in for intrigue. A fun read for all ages!